The XVIth Warrior Blog: WE DID IT!! GLASGOW WARRIORS ARE RABODIRECT PRO 12 2014 FINALISTS!!! 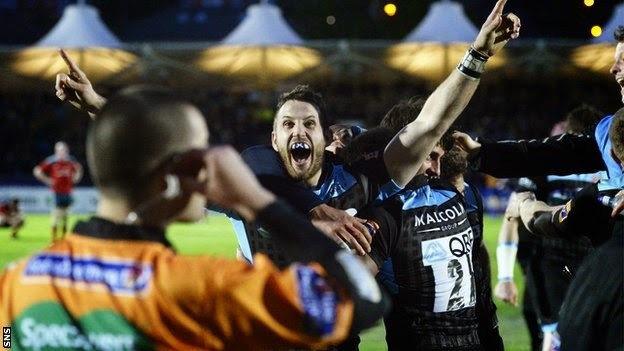 It has been an amazing season, and now Glasgow are the first Scottish team to make a Rabodirect Pro 12 final. With Leinster v Ulster deciding if this is the year that goes down in history as the best ever for Scottish professional rugby with a home final on the cards. We would like to take the opportunity to say a massive thank you to all the supporters who have not only been behind the club but also The XVIth Warrior! We move into our 3rd year as Glasgow Warriors official supporters club and we could not have done it without the engagement of all our fellow supporters, so thank you! We hope to see this season finish on the ultimate high, but in the mean time we have uploaded videos to our YouTube channel!